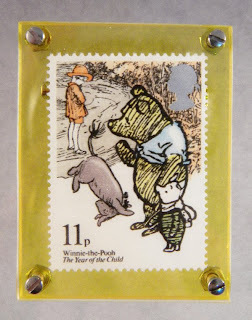 Below are stamp pins made with stamps commemorating classic children's books from Great Britain They are all very nice looking with the illustrations coming from the original books. I can never get enough of these stamps to frame up. This is a stamp from Great Britain commemorating Children's literature(1 in a set of 4) in Great Britain. 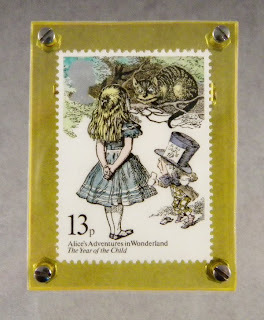 The picture used is from the original Tenniel illustrations. What can I say? It's a great book who's influence upon culture is all encompassing and continues to this day. I do this in transparent yellow or green, they both look good, so I do both. If you order and have a preference, let me know. They are $20.00 each, shipping included, and come in a small cloth, drawstring bag. Another stamp from Great Britain commemorating children's literature. This one is, of course, Winnie the Pooh. Another great book with great illustrations. I could easily pick it up at anytime and read it. It's always good. Milne wrote a great book and whoever picked Shepard as the illustrator deserves a big thank you from all of us. Weird fact about Milne: one of his teachers in elementary school was none other than H. G. Wells. 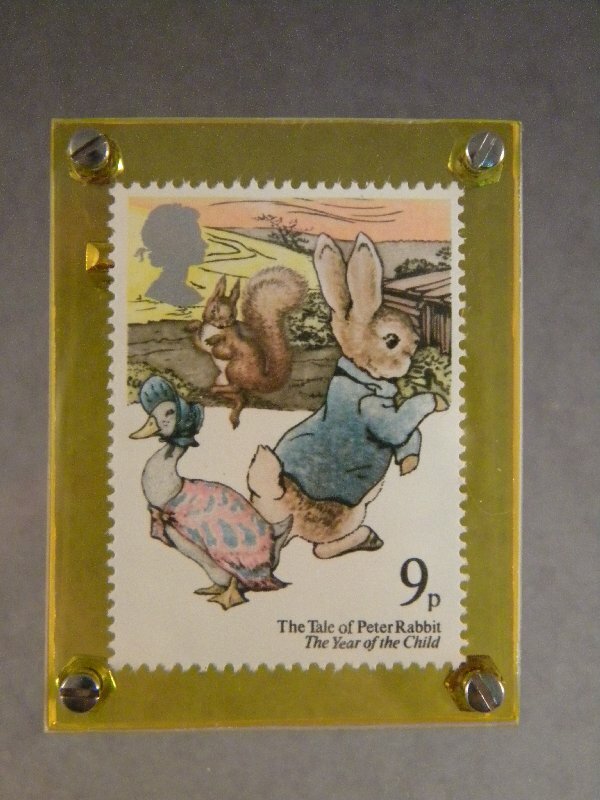 This is another stamp from Great Britain that features the art of Children's literature. 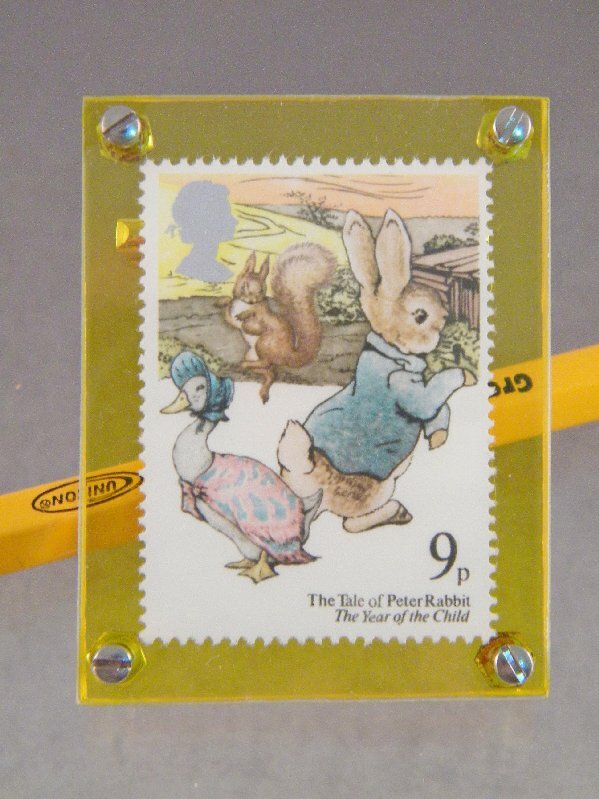 In this case, it's Peter Rabbit created by Beatrix Potter. Ms. Potter created some beautiful illustrations and created some very iconic imagery and content in the history of children's literature. She this did at a time, and under conditions that were hardly favorable for a woman writer. Look at how many books have copied and borrowed from the imagery that she first set out in the early 1900s. The pin looks nice too. $20.00 each, free shipping, and a cloth gift bag is included, no gift wrapping will be necessary. This is a from the Wind in the Willows by K. Grahame. 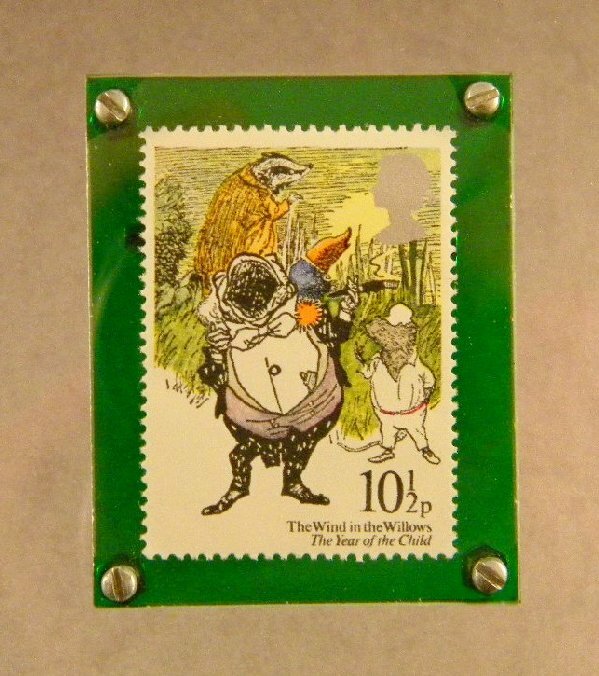 Mole, Badger, Rat, & Mr. Toad. Another work that inspired so many others. I never liked this book as much as the books above, but I recently downloaded it for free from the Gutenberg Project, with illustrations for my e- reader, and it looks real good. Even has the map I tried to copy as a child! It is better than I remembered.